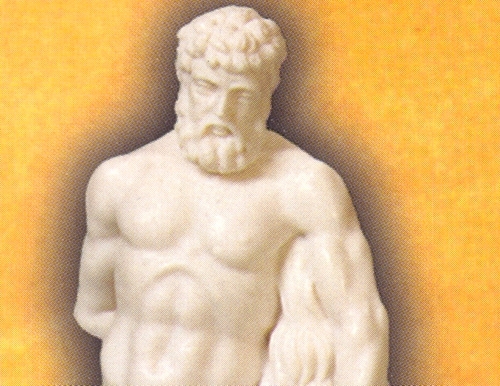 Statue of Heracles made of fine white alabaster stone. Heracles or Hercules was the son of Zeus and Alcmene. His jealous stepmother, Hera, tried to murder the infant Hercules by putting a serpent in his cradle. Luckily for Hercules, he was born with great strength and killed the serpent. By the time Hercules was an adult, he had already killed a lion. Eventually, Hera drove Hercules insane. Due to his insanity, Hercules killed his wife, Megara, and their three children. Hercules exiled himself because of the shame that he had brought on himself through his lack of sanity. Upon his death Hercules ascended to Olympus, where he was granted immortality and lived among the gods.